There’s no question that browsing through seed and nursery catalogues is dangerous. The fruits and vegetables are luscious, colorful and perfect, and even though I have access to organic fresh fruits and vegetables through our local food co-op, I no longer feel comfortable buying produce that has travelled thousands of miles to get to me. Besides, nothing is ever as good as something just picked that day. 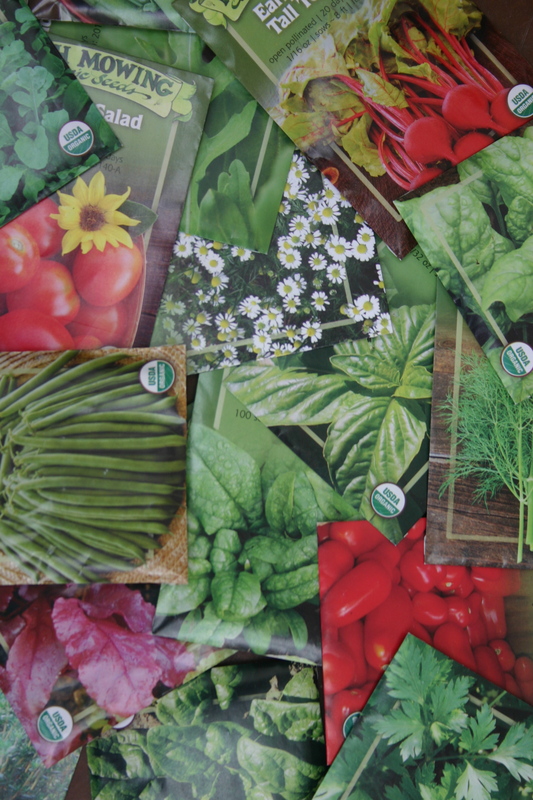 The seed catalogues waken a longing for fresh. They make me think about last fall’s harvest when vegetables happily ruled our life, and we only went to the store for milk, olive oil, tea and toilet paper. 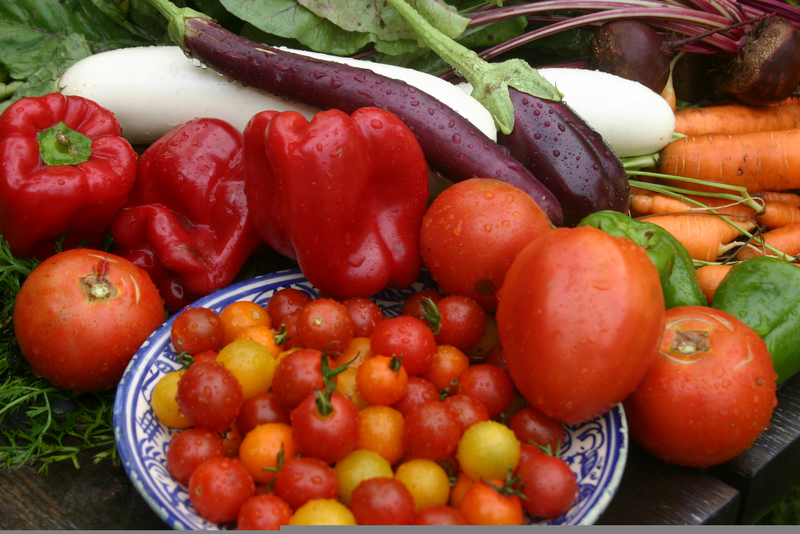 If I had a large piece of land on which to garden, I would not be able to resist the temptation to try many more new vegetables and fruits. My husband declares that we will never move out of town if only for the simple reason that he does not want my ideas for a garden to take over (and I suspect he worries about Barbara’s husband in this regard!). So today I did something radical. I called my friends Margy and Jordan, whose chickens I care for when they are out of town, to ask if they would let me plant raspberry canes and blueberry bushes at their place. Oh, and currants. Maybe goose berries, too. (Secretly I also want to plant an asparagus bed, but am not ready to confess to this.) I haven’t mentioned these other berries out loud yet. Planting cane berries is not an idle thought. When I look at the different kinds of food that could be produced in this county, given its soils and climate, berries — cane berries in particular — will grow well here. They are easy to flash freeze. They are wonderful in jam. They are delicious. And they are really, really nutritious. What I really want is a berry house, like the one my friend George had in Connecticut. He built a house of netting around his berries, so the birds and animals could not eat them, and under it’s roof grew varieties of cane berries, blue berries, goose berries and currants. When our son was three, I remember going into George’s berry house to pick — a giant play pen full of delicious fresh fruit. Margy and Jordan said yes. We’ll meet soon to decide how many bushes to buy. We’ll have to meet over dinner because we all love to cook. I suspect my husband and I will maintain the bushes, and supervise the pruning. They’ll monitor the watering. We’ll plan together. We’ll harvest together. Chances are, we’ll have to cook together often, too, because part of growing fresh food is savoring it with someone else. “Mom, you’re out of your mind! What are you doing?” In the beginning of March, the days are noticeably longer and the sun actually has some warmth in it. Early mornings feel fresh. But the wood-stove is still lit, and on top of it, in a large flat pan, I am boiling sap. The sweet steam hits when you come in through the mudroom. I don’t think so. Actually I don’t care and the ceiling needs painting anyway after all the ice damming. I am going to make syrup, if for no other reason than to see if I can. 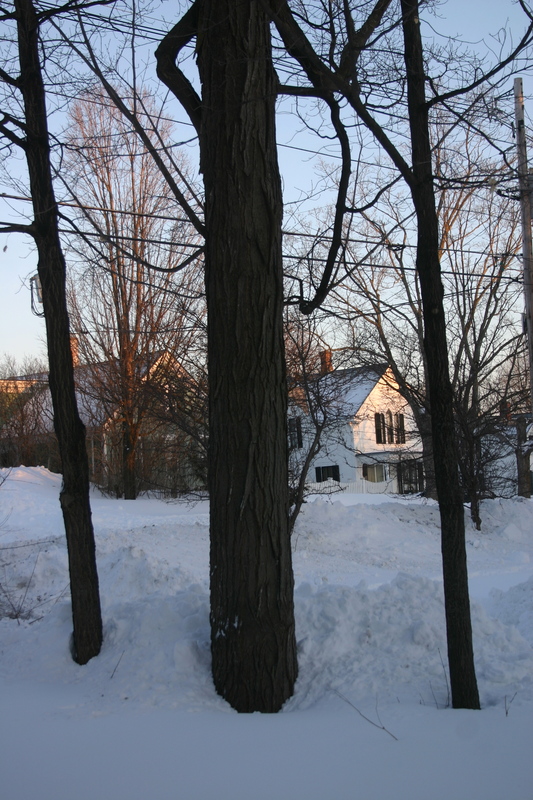 There are five maple trees on the line between my house and my neighbor’s – the line we call the lower forty, which, in this case, means forty feet. Only four of the trees are large enough for tapping, so I have borrowed four sap buckets, lids and taps from friends who sugar in Shelburne, and I have bought a white felted filter from Paris Farmer’s Union to strain the hot liquid. It is a far cry from the days and nights I spent sugaring thirty years ago in northwestern Connecticut in Great Mountain Forest. The sugar-house, nestled down in a hollow, was surrounded the sugar bush. 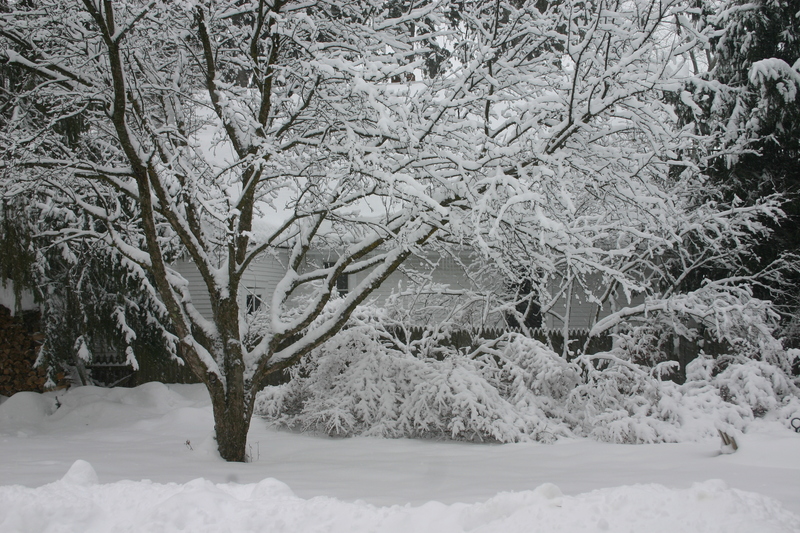 Its eaves were deep,draped with icicles; the woodpile in back a fortress wall. After collecting sap, riding on the back of an old red tanker truck, filling it by hand, bucket by bucket, we piped it into a collecting tank and headed in to watch the boil. Inside the building, all was dark wood and steam, the fire pulsing, and metal surfaces, evaporating pans, shining; steam wafted up through vents high above. To a young painter,this was a dream, it felt like being inside a water-color. But food, actually a kind of nectar, was being produced. We fed the fire. We watched. We measured. We tasted. The sound of bubbling mesmerized: the steam was intoxicating. I took paper and watercolor paints to try and capture the wet warmth of that room, snug against the chill of the night outside. How to paint the flickering, steamy light? Capture the sweet, faint dirt smell? How would you describe the taste, a sweet like no other, with its earthiness, the roots of trees and water of leaves within? As a young child, we collected sap and boiled it in a cauldron slung from a tri-pod over a fire in southern Vermont. Soft spring snow gave way underfoot. Below the fire circle was the sledding hill. Our fathers made the syrup; we rode our toboggans. It is clear that the real syrup makers know things I can only dream of. I visit them every summer at Field Days, check the colors of the syrup, taste the different grades, ask questions, savor the smoothness of the maple cream (my favorite) on my tongue, nibble into the molded maple sugar candies. I visit sap houses every winter. I help friends collect the sap in buckets. I sample the fresh hot liquid as it reaches perfection, sometimes eat it on snow, and occasionally crunch pickles to cut the sweetness so I can have more. But I have never observed a boil from start to finish. Frankly, it doesn’t go that well. It is hard to figure out the right temperature. At first I boil it too hard, and the syrup is too thick for the filter. I start again. Outside, the weather warms, the sap flow alters. Other days, the sap runs so rapidly, I can’t keep up with it. 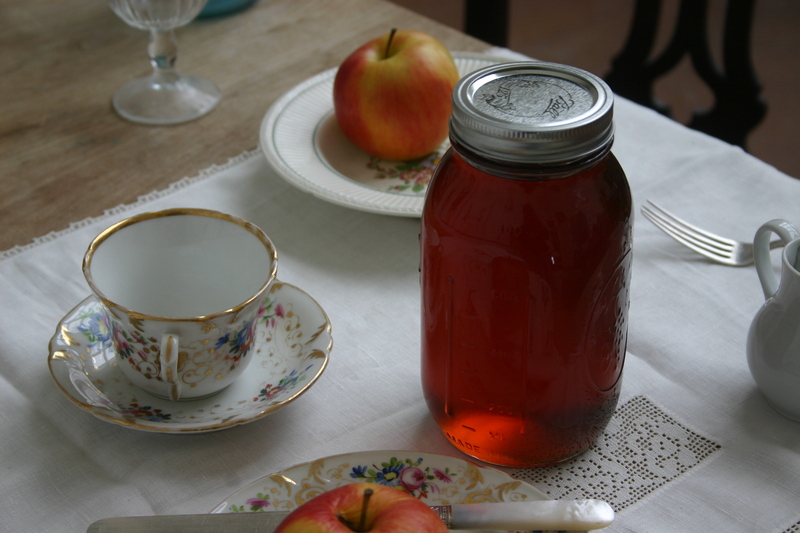 But eventually, I find a rhythm and the right boil, and finally there is a clear golden quart of syrup. In the end, I have four glorious quarts of light brown maple syrup, that my family nicknames “South Street Gold.” We savor it teaspoonful by teaspoonful. The house smells of wood-smoke and a vague unidentifiable sweetness. The ceiling is not sticky. We’ve lost no wallpaper and we look at our maples with more respect; they’ve sweetened our life. The days are getting longer, but for the moment all is snow. Eight inches have come down with perhaps another foot coming by nightfall. I hope so. 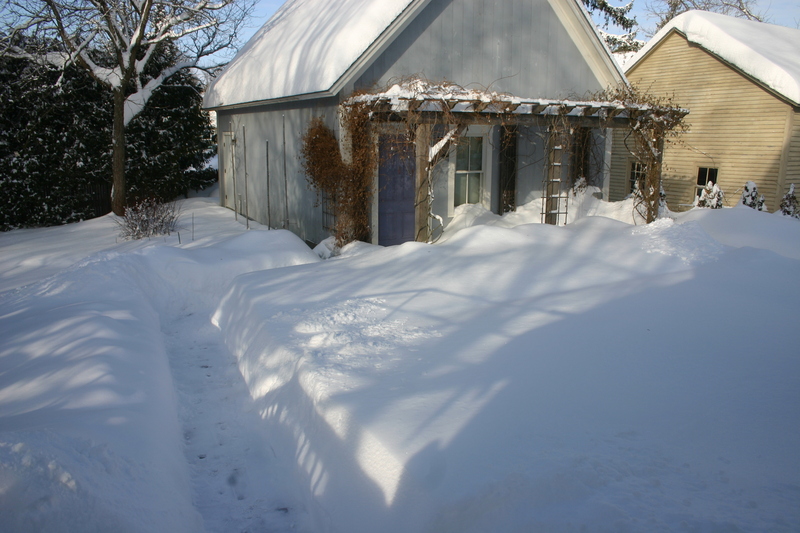 I went outside early this morning to shovel the walks to the woodpile, the studio and the front door (in case the mail man comes), and discovered coming back in, that I had locked myself out. Walking to Molly’s to use her phone I note the town is snugged in: no cars on the street, very few driveways and walkways shoveled. The world is muffled. The downtown is a ghost town. One storeowner friend shoveled, salted and swept her sidewalk, but then decided to go home anyway. No one is coming in to shop. When the boys were little, a snow day was a welcome surprise: an unexpected morning in PJ’s, cocoa, pancakes, books. Invariably the phone would ring and other children would appear since their parents had to go to work. The mudroom floor became a sea of mittens, wet wool hats, snow pants, and dripping boots. After lunch I would kick everyone out to go across the road to the sledding hill or out to build a fort. Today, boys away in college, a husband traveling, I bank up the woodstove, drink cup after cup of tea, shovel a little, and feast my eyes on Barbara’s seed catalogues before I go work in the studio. The choices are dizzying…. Heirloom varieties? New cultivars? Organic? Yes, organic. Shall I build a small hoop bed over one of the raised beds and start things early? How soon should I start my seeds? As always, it is terribly hard to restrain myself from buying too many seeds. 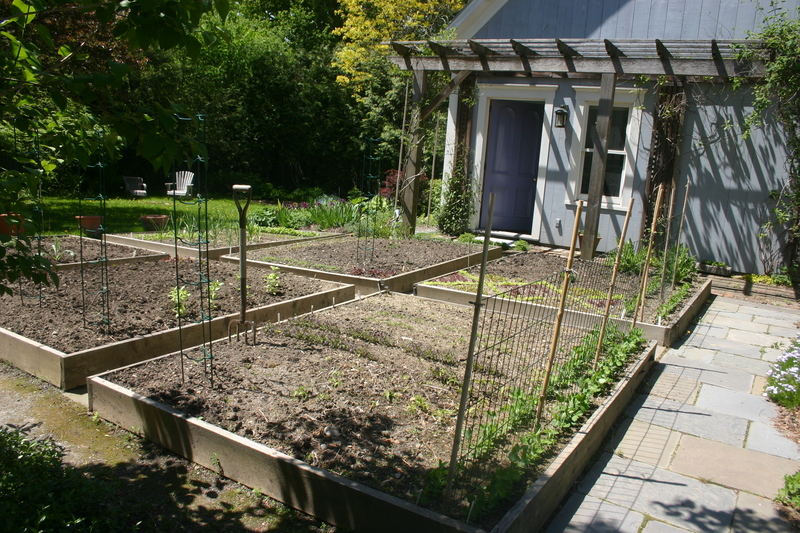 The garden is not large: six raised beds, measuring 7 X 8 feet each. There is a long perennial bed, which stretches 38 feet long, six feet deep, on the north side of the lot. There are shade beds, and one large patch of earth that gets enough sun where I have finally and systematically begun to plant perennial herbs. Which ones have survived the winter? What will need moving, dividing, replacing? Shall I start more from seed this year, and buy fewer starts from Judy’s greenhouse? I read in one catalogue that rosemary started from seed has a stronger flavor and aroma. I browse the Basil offerings: Summerlong, Sweet, San Remo, Genovese, Boxwood, Greek, Thai, Lemon. Each one has a different intensity and aroma. I always grow Genovese Basil for pesto, but last summer, I tried lemon basil which turned out to be a pleasant surprise in salads, but didn’t translate when turned into pesto. My family didn’t like it either, so I am not ordering it. Thanks to Barbara, I want to learn more about Thai cuisine, so I order Thai Basil as an experiment. I decide that boxwood basil might do well to edge the herb garden from the lawn. More decisions to come. It is a precious moment when winter starts to dwindle in fits and starts, and spring begins to gain confidence as the days get longer, first slowly, then faster, and it is finally time to get my hands back in the soil, smooth out the lumps, cast off the winter coverings, and put peas in the ground. It is like the first stirrings of excitement when I begin a new painting: the markings of the design, the early splashes of paint, the careful building of layers, all herald something new. With plants, so much is beyond our control, and yet, at this time of year, it is all about planning and potential. 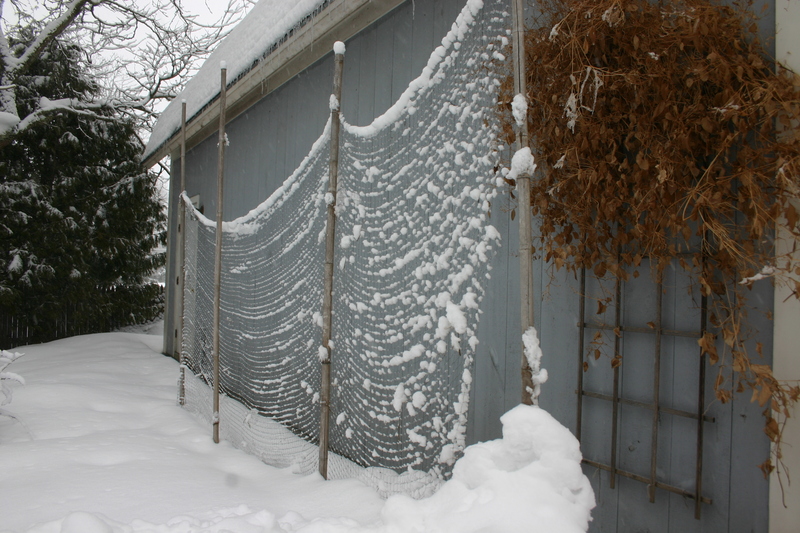 The raised beds between the house and studio where I paint every day are moist, the heavy cold water of melted snow drained away. Covered with the leaves and flecks of detritus from winter blows and bits of straw mulch from last year, the tips of garlic plants are peeping out of the soil. Sorrel, with its red-tipped green tinge is emerging, iris leaves tentatively poke through the leaf mulch, and some of the thymes that line the path have new tiny green leaves. The frothy leaves of giant poppies are unfolding. 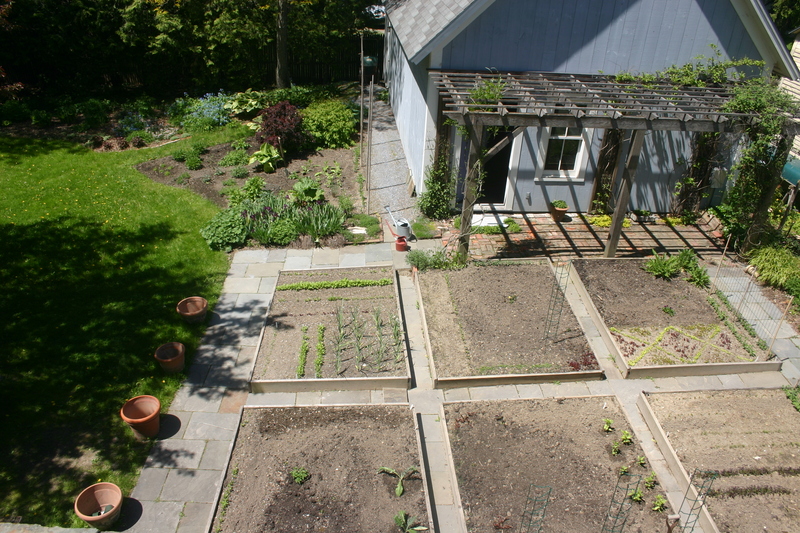 To look at these naked beds, brown, grey—clean slates—is to imagine them planted with tidy rows of green and color. Every year, I plant differently, rotating crops, changing the angles of rows, creating miniature knot gardens from time to time, trying new spots for a plant given the shade that develops when the changing angle of the sun casts tree shadows across the beds. Each spring means a new design, a fresh beginning on a structure sunk into the ground fifteen years ago, on top of what was driveway. Each spring brings the promise of fresh food grown on my own little plot of land, and in a world that seems pretty crazy and chaotic, that feels reassuring. Mine is an in-town garden. The house, which dates back to the 1870’s, covers most of the .3 acres we own. The rest is planted, with six raised beds, and a couple of borders that contain perennials, and an herb garden. Arborvitae hedges line the periphery, and a crab tree that in 1996 was not much taller than my husband, now towers above the back of the house. Rabbits have found us, even a wood chuck who has seventeen holes in the meadow across the street (my neighbor Jane counted them) ventures over when we grow broccoli and brussel sprouts, but most people don’t know the garden is here, tucked in behind a sheltering wall, a little oasis in the middle of town. 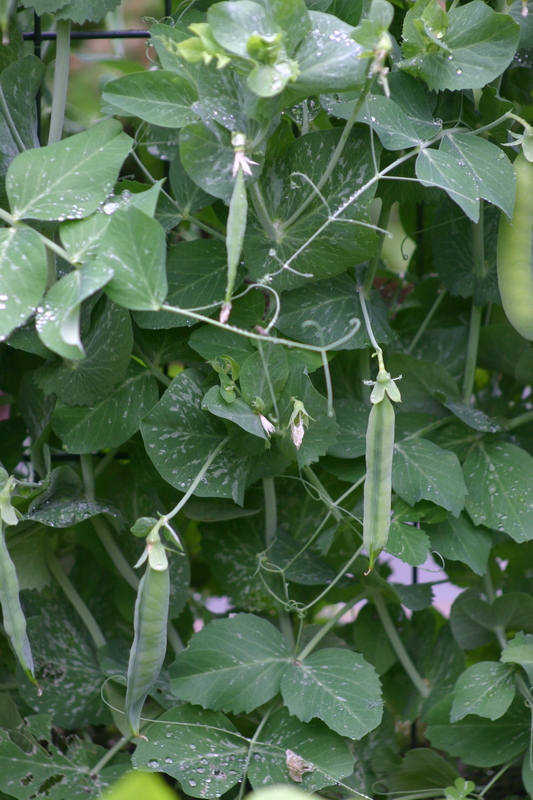 In fact, it is so sheltered I can grow things some years that can’t be grown elsewhere in Addison County, which ought to mean the peas can go in the ground soon. At this time every year, I have big plans. Even though the air is still fresh and warmer, we light a fire in the wood stove. There’s the wall of sweet peas I am planning, whose flowers will perfume the air when I step outside come summer for breaks from the paint fumes. There will be six varieties of eggplant, which I plan not only to eat, but to paint, using the most beautiful ones in a still life. Artichokes, will be planted in the herb garden, not for the fruit, but for the flowers so purple they beg to be painted, along with their silvery, spiky leaves. Tomatoes, herbs, lettuces, leeks, garlics and greens – all will be planted for both their beauty and because we like to eat them. I pick up the telephone and call my friend Abi who has a soil thermometer. It is more fun to call her repeatedly over a season to ask for the temperature of her soil than it is to buy my own thermometer. This way we chat about what we are planting, how it is going, what is different this year from last, and share part of the excitement of another growing season. I add a couple of degrees onto her numbers since my patch is south facing and there are no breezes. Cold Frames. That could be the key for this need I have right now to dig. The one time I built a cold frame, I moved too fast and situated it below a south-facing roof. When the inevitable early April snow came, it slid off the roof and smashed the glass. We have found another south facing spot under a gable, and I could build a new cold frame in the next few days. I pull out my grow lights and analyze my seed packets. It is not too soon to plant the six varieties of eggplant, leeks, perhaps a couple of tomato varieties. I am not starting any brassica this year to insure that the wood chuck will stay away. The labels are neat, with date planted, seed producer noted. I leave the trays in the vicinity of the woodstove, see that the rain outside is starting to look like snow, and realize it would be okay if the sap run went longer for my friends who make maple syrup. The peas can wait another week or two. A version of this article originally appeared in The Addison Independent on May 20, 2010. Every May we stand, looking at six raised beds in a part of the yard that was a driveway when we bought the house. The first thing we did that April, 1996, was move a ten foot high arborvitae hedge that ran between a little garage and the house to the far side of the driveway, to create a sheltered, south-facing spot for a vegetable garden. To the excitement of two boys, then five and eight, the man who moved the hedge came to Middlebury all the way from Newport, Vermont, hauling a goose-necked trailer on which perched a bobcat with a cone-shaped tree digger on the front. As the driver settled into the cab to drive the rig off the trailer, loud music suddenly erupted from two speakers on the side of the bobcat. “What’s that?” yelled the boys. “I like to work to music,” the driver shouted, as Puccini’s “Tosca” poured forth, each aria soaring above the houses in the neighborhood. The machine twirled back and forth across the driveway, first toward the hedge, digging down four feet, then scooping the tall green columns up, one at a time, each with a cone shaped root ball below, then dancing across the gravel to settle the cones gently into their new site. Three hours later, suddenly quiet, the hedge was moved and we had a place in which to build our raised beds. “We’ll have many patches to share — for all of us. Which part do you want to plant?” This was what we had all been waiting for. Young children love the magic of putting seeds into the ground and waiting to see what comes up; they know it is a miracle without our telling them. Beans bust out of the soil quickly and twirl up posts. Baby carrots and radishes can be plucked out of the ground, wiped off with fingers and eaten on the spot. Peas pop out of pods. Zucchini turn into baseball bats. In late August, there’s corn to be husked, picked only just as water comes to a boil. As a child, I spent hours in a vegetable garden in Connecticut, planting the seeds in late May, weeding beside my mother (or lying on my back, looking up at the clouds), or running down to pick the corn when she put the water on to boil. We had been loaned a patch of dirt in what had been an estate garden for the grand mansion next door, now occupied by a very old widow. Ringed with fruit trees, the ghost of a semicircular kitchen garden was fenced with grape vines and long rows of dipping yellow lilies. The remnants of four huge beds sprawled, separated by wide grass paths with an old well in the middle, now filled with stones. One of the beds was filled with a forest of asparagus fronds, but at age five, when we first went to plant, I didn’t know what asparagus was. In a yard as small as ours, just three tenths of an acrea, and most of that is covered by the house, raised beds are the way to go. Drainage, vital for healthy plants, is good. You can plant many more plants in a raised bed than in a flat garden. It is easier to tend because of the height. And you can organize the soils and the plants by variously amending the soils in the different beds depending on what you plant. We planned the dimensions and lay out of the beds on graph paper. I needed to be able to reach the plants easily without walking on the soil so it would not be compacted. Then, after plotting out the beds with measuring tape and string, we dug down 12 – 15 inches in each rectangle, removing either gravel from the old driveway, or sod from the former lawn. We nailed together rough-cut fir boards for the sides, 2 X 12’s, 7 and 8 feet long, and placed the rectangles on the ground. We shoveled topsoil into the four (now seemingly enormous) holes. Then we top-dressed the beds with composted sheep manure from a friend’s farm in Addison. We top-dress the beds every year with ground up leaves from our yard, compost from the kitchen along with garden clippings. We also add ashes from the woodstove from time to time, or lime to sweeten the soil. We added sand to a bed designated for herbs, many of which prefer somewhat less rich soil. That first year garden, fifteen years ago, was miraculous. There were no pests, no rodents, no bugs, no woodchuck (they all arrived the second year). The garden was new, and the word had not gotten out. The amount of produce, using a square foot gardening system, was astonishing. Site: Try for a spot that gets lots of sun, and where water does NOT collect. My beds face south. They are sheltered (which makes it warmer), and the ground gently slopes to the south, which is ideal. Ask yourself the following questions: how near is a water source? Are there big trees nearby, whose roots will compete for moisture and nutrients? How much sunlight do you have? Size: Walking on soil compacts it. So design a bed that you can easily access. Four feet is ideal. Mine are 7feet by 8 feet, and I sometimes lay a board across to walk on. Paths: Some people have lawns between their beds – so design a path that is wide enough for your mower. My friend Margy removed the topsoil from the paths, and filled them with wood chips. Barbara’s paths are filled with gravel, and her beds come in a variety of shapes. Last year, my husband and I laid blue stone between our raised beds. The soil in raised beds warms up faster, so your vegetables get a head start. Raised beds are easier to tend. Raised beds dry out faster, so monitor them carefully for watering. Ideally, you should mulch, but that is a topic for another day. Different beds can contain different soils, depending on what you want to plant. 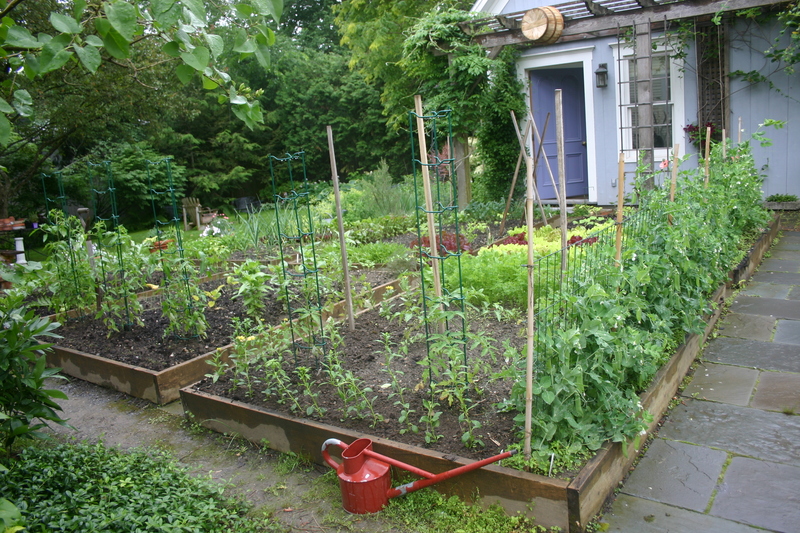 Raised beds can be planted intensively, but watch out: don’t over – plant! Not all vegetables work well in a raised bed, like corn, squash and pumpkins: they need more space. They go in flat beds, which are in the ground. If you haven’t gardened before, start small. We started with four smaller beds and now have six large ones. Some people have both raised beds and flat beds). Even though it is 18 degrees this morning, there is a different quality to the sun-light. Perhaps it is the angle, though I have no way of measuring. It just feels as if it is a little higher in the sky by 10 am. And it is slightly more yellow. The picnic table is draped under a foot of snow, blue in the shadows of the yard. The raised beds are indecipherable under their white blanket, interrupted only by the browned tops of un-harvested leeks. I was smug last fall when I left the leeks in the ground. I had thought to harvest them the morning of Thanksgiving so I could boast to my New York City relatives that they were freshly picked “this very morning!” before the ritual braising with lemon, home made chicken broth and butter. But the ground was frozen that morning, cement hard, and so they remained. Then snow fell. And there they have remained. I am desperate to put my hands in soil. This morning saw the final planting of paper white bulbs. I brought the scented geraniums down to the south facing windows in the breakfast nook, away from the grow lights they’ve been hunkering under all winter (along with bulb starts, and rosemary in pots from last summer’s garden). 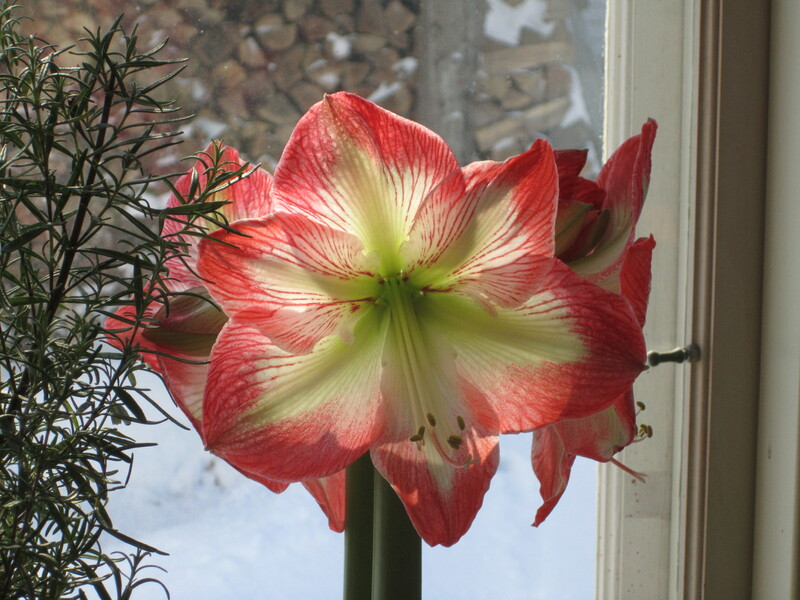 One Amaryllis is finally opening; I have a tiny window garden, green and bright, to sit in at breakfast, while through the window, the snow is drifted high against the house. Imagine my surprise when, after noting the change in the light, I find packets of seeds just arrived at the co-op. It is only January! Seed catalogues have already arrived at the homes of my more organized friends. But I don’t subscribe to a single catalogue; never have. Instead, I wander all the farm centers, gathering seed packets one by one, while reading the instructions and savoring the descriptions of succulent fruits, vegetables, and blossoms to come; or I buy seeds by the teaspoonful at Paris Farmer’s Union. On three tenths of an acre I do not grow vast quantities of any vegetable, but I grow masses of tomatoes and more salad greens than we can eat, not to mention peas, cukes and beans, garlic, and butternut squash. And part of having a garden is, for me, visual: I choose some plants and vegetables for how they look… My garden is literally a palette of colors and tastes. I would like to grow more, but the limitations of a village yard, the shifts of light and shade from neighboring buildings and trees proscribe what I can plant, and how much. Now is the Walter Mitty time of my garden. 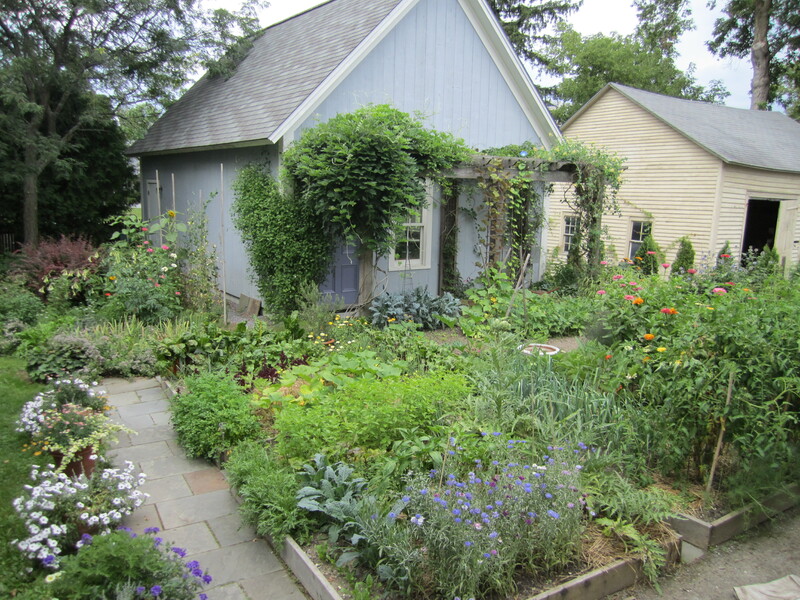 I sit back and day-dream about what the garden CAN contain, what it might look like. These plans are elaborate because the conditions are perfect. From my armchair by the wood stove, there are no pests. And it doesn’t take much work: no sweat, no aching back, no mosquito bites. My tomatoes are large and sweet. I invent a new kind of potato. My squash plants become self-pollinating….. I find a way to solve the food issues in this country.